Even now, in the days of digital downloads and Spotify streaming, there is really nothing better than good album art. 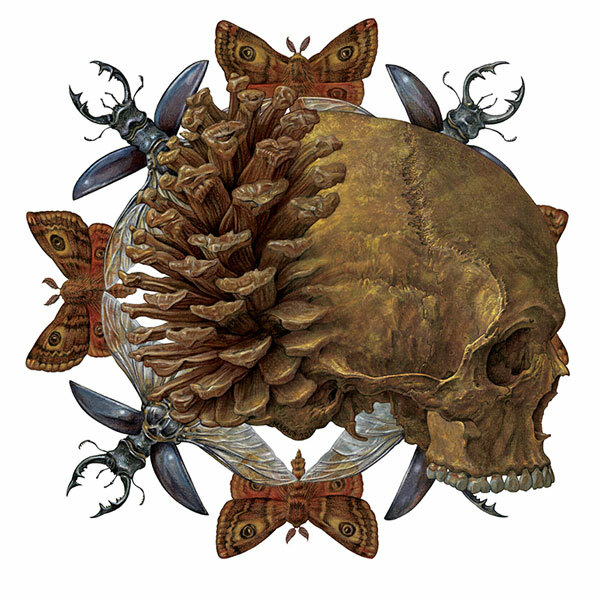 And if you can find beautiful, dark, surreal art on a metal album, all the better, right? 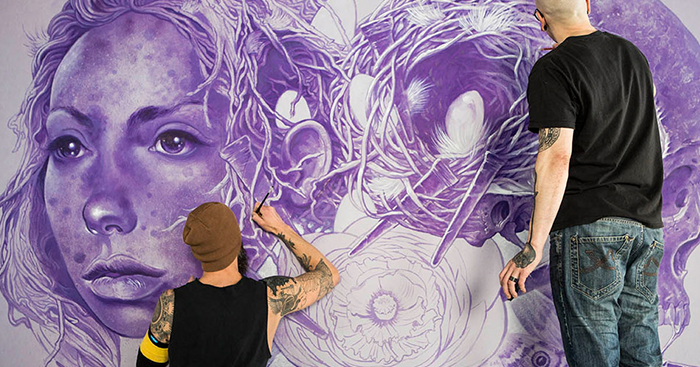 John Dyer Baizley and Marald van Haasteren worked together to make the artwork for Purple, the latest album by Baizley’s band Baroness, and now, working in conjunction with screenprinting powerhouse Burlesque of North America, the two are bringing their drawings, paintings, and prints to town for a show at CO Exhibitions. RW: John, you are based in Philadelphia, and Marald is based in the Netherlands. How did you all end up having an art show here in Minneapolis? What is your connection to Burlesque? John: I have been printing my work exclusively through Burlesque for about a decade now; I consider them the best screenprinters on the planet and a far more creative enterprise than any of the other print shops I’ve had experiences with throughout my career. They are more concerned with cutting edge techniques and artistic presentation than most other screenprinters, who seem focused primarily on clean technique and sleek presentation. Occasionally at Burlesque, we end up creating prints that require spontaneity and expressiveness, which is an atypical quality for a screenprint (and screenprinter) to have. They have struck a balance between beautifully executed printing, and playful, creative presentation. Marald and I have been friends for quite a long time now, having met and maintained a relationship through our mutual involvement in the music scene. I have admired his work for many, many years, and “Desperation Burns” is both a showcase of the artwork that the two of us made for the Baroness album Purple and an attempt that I’d like to make to showcase Marald’s work to an American audience. I spend so much time here in Minneapolis each year; CO Exhibitions was the natural choice for this event. It also allows us to create a number of prints of Marald’s work, and to hang his originals, which I know he is incredibly excited to do. RW: “Desperation Burns” is based around the artwork you both created for the latest Baroness album, Purple, and will include brand new work you made together here at Burlesque. Your styles are similar but definitely distinct, each bringing a different kind of stylization to your surreal, macabre drawings. Can you describe your collaborative process for this show? Is it like “I’m over here, you’re over there” or are you working closely together on some new pieces? John: We worked as closely as possible on all the images for this show, thanks to an easy Internet connectivity, and furthered by the fact that I tour through Netherlands quite frequently. We’ve been sending our drawings back and forth for the past couple of years, and we work together in a surprisingly seamless way. For the collaborative work we’re doing, we planned the main ideas ahead of time, made a few reference studies, and have been working simultaneously all week, late into the night. We have a great rapport so, despite the intense labor, we are having a blast. RW: What do you both see as the biggest influences on your work? Is it other artists, the music itself, life experiences? Marald, some of your drawings of skulls remind me a lot of old Dutch still lifes in their tone and detail. Is that a conscious reference, or have you kind of arrived at skulls mostly because of metal imagery? John: Life influences affect my art as much and more than any particular artist, art or music, so deeply that I’m beginning to think there’s very little separation between my art and my life. This may also be a result of the fact that I simply never stop making things. There are no breaks, no holidays, and very little sleep. I try to absorb the great scope of life’s experience (the good, bad and UGLY), and express myself through my art and music. Marald: I think there’s a bit of both, but there has recently been a shift in my work that leads me to move away from imagery that is too overtly “metal” and move towards the classical imagery that I was initially drawn to in my youth. RW: John, your work is almost like a weird combination of Frank Frazetta and Frida Kahlo, with these stylized nudes shrouded in all of this bizarre symbology and narrative. Are these symbols and narratives fully fleshed out in your head? For instance, are the four women on the cover of Purple representative of different personalities or characters for you? John: That’s a tricky question. Yes, in many ways the symbology is distinct, but more importantly, I consider them archetypes, and I let my subconscious work out themes through them. 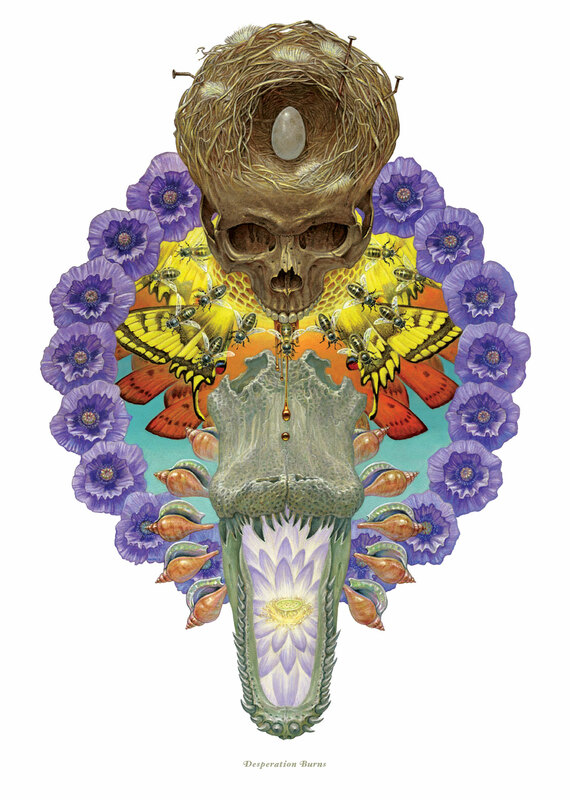 The literal imagery that I use is almost insignificant; they are things I simply enjoy drawing on one level. However, I believe that the sum total of all these visual metaphors, symbols, and mixed mythologies creates a narrative or concept that I don’t need to articulate or really understand right now. In time, it will unfold itself to me, but I do a tremendous amount of research before I ever make a single line or brushstroke. RW: I’m also impressed with how deliberately feminine Baroness’s artwork seems to be, even down to the band name, of course. Skulls and naked women are nothing new to the world of punk and metal music, but this artwork has a delicacy and a temperament far removed from the shock and exploitation most people might expect from the metal scene. As a male artist, do you see it as a challenge to balance the use of naked women against the history of sexual objectification, or are you simply drawing from the heart and this is what comes out? John: Yes, I’d like to think that through Baroness, and our artwork, we could offer an alternative to the expected lexicon of music-based imagery. There is enough machismo based, sexually objectifying, and frankly idiotic images out there; I think life, art and music is better than that, and we have something bigger to tackle, and potentially the means to do so through the band. But, as always, I demand a challenge, both for the viewer/listener/audience and myself. RW: What can we expect at this show that we haven't seen from either of you before? John: Something enormous in scale, and something that neither one of us could have done without the help and guidance of the other. It has been a surprise as we’ve created it; we hope our excitement and inspiration translates to those in attendance. 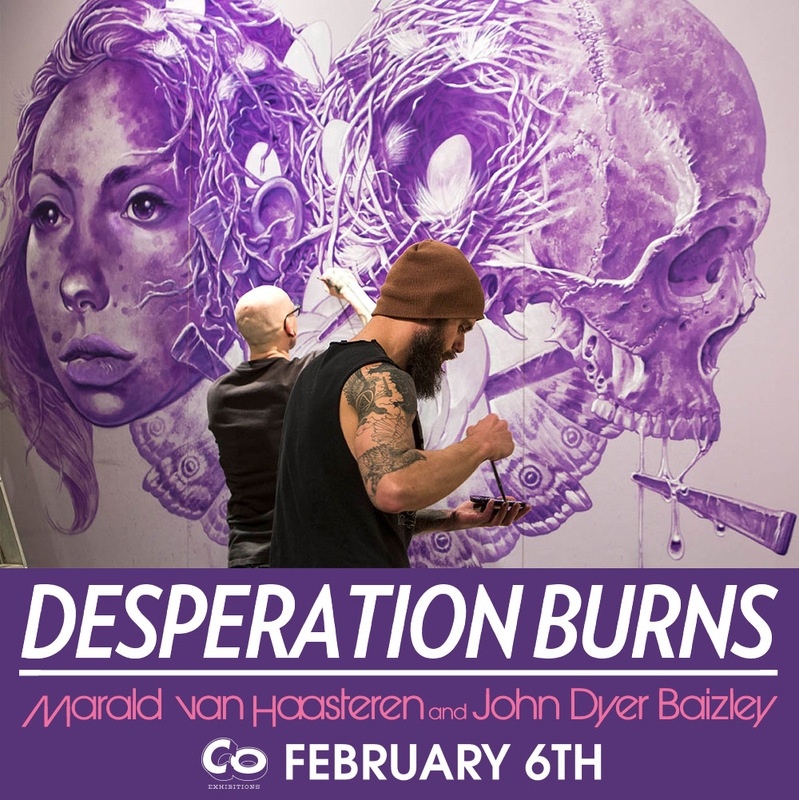 Desperation Burns: The Art of Purple opens Saturday, February 6th 7PM - 10PM at CO Exhibitions in Northeast Minneapolis. The exhibition will be on view through March 4th. 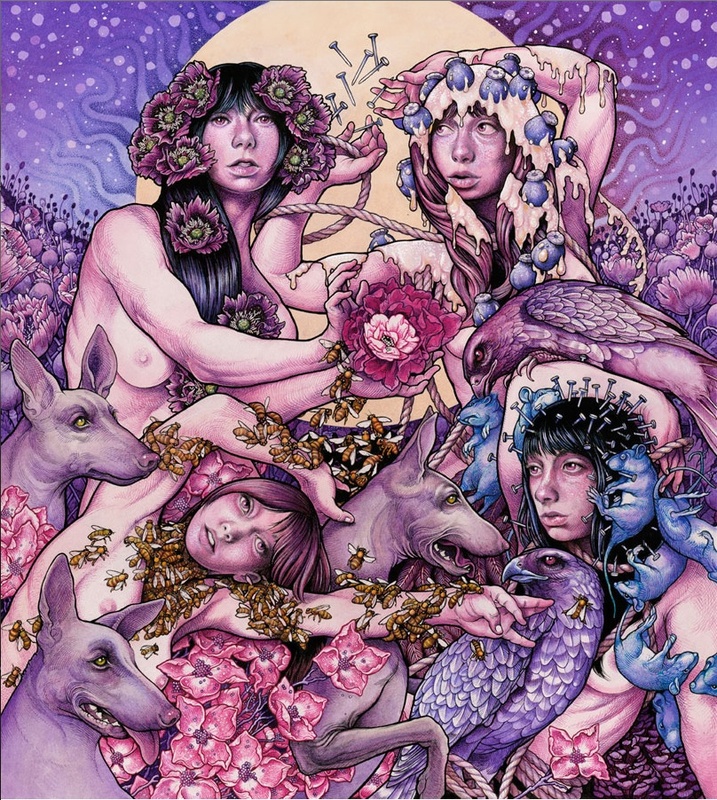 Buy Baroness' latest album Purple on Amazon to get ready for the show.